A swooping frame leads down to textured tan glass in this oil-rubbed bronze chandelier design. This handsome fixture is a wonderfully balanced look, blending swooping arcs and squared glass. Each textured tan glass shade of this five-light chandelier stands regally atop a small arm for a beautifully updated transitional style. 24 1/2" wide x 32 1/2" high. Canopy is 5" wide x 1" high. Weighs 12.76 lbs. Uses five maximum 100 watt standard-medium bulbs (not included). 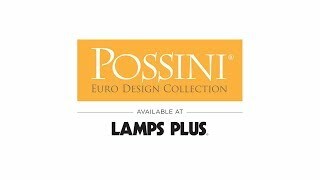 Five-light chandelier with uplight glass by Possini Euro Design®. Oil-rubbed bronze finish. Textured tan glass. Really like the classic design and the color matches a entry light. I like the style and unquie shades. We thought it would make a beautiful accessory to our new home dining room. We're hoping it gives lots of light to our family meals. Does this come with wall sconces and entry light? BEST ANSWER: This fixture is sold separately. However, our product specialists team would be happy to assist you with coordinating pieces. They can be reached via chat or phone (877-704-2425). BEST ANSWER: Hi - This weighs 12.76 pounds. Can you swag a chain dropped chandelier? BEST ANSWER: Hi - This includes 6 feet of chain and 10 feet of wire. 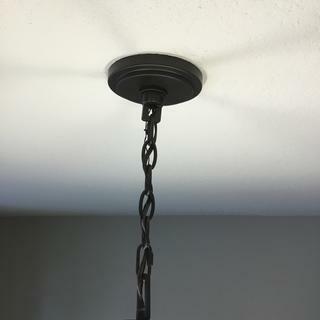 You may purchase additional chain if you need to swag the chandelier over the table. But, this does not include a plug or switch. Is this light able to be on a dimmer switch? Yes. Mine is on simmer. With led dimmable bulbs. Yes, this works on a dimmer switch. No problem. Yes, as long as you use dimmable bulbs. Why does my 3 star review not show here? I just resubmitted my three star review. Let’s see if it gets posted or screened out. Is this a really dark brown (almost black) as it looks on my monitor? The last one I purchased looked to be that dark, but when it arrived it was lighter brown with an orange-y cast to it--not what I need. BEST ANSWER: This is an oil-rubbed bronze finish and is dark brown, but with some black color undertones. Yes, it is very dark brown, almost black. Yes, it’s dark brown almost black. Chandelier looks nice and we had great support from the Lamps Plus salesman on the phone. BUT, it seems like including a ground wire was an afterthought. Instead of manufacturing it with a three-part insulated wire it came with a two-part wire plus a bare wire for the ground. Strange, and it looked ugly, so we coated the bare shiny copper wire with black nail polish. Beautiful light, arrived on time and looks great! Great packaging no chance of breakage and package arrived much sooner than we anticipated. The chandelier is gorgeous. It arrived early and intact. I love it !!!! I am waiting to put it up after my remodel is complete. I can’t wait to see it installed it is beautiful and will match my decor perfectly! 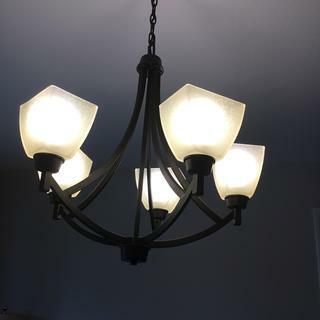 We purchased two of these lights and they look good and produce a great amount of light on our dimmer switches. One globe had a small flaw but your service department replaced it immediately. Very pleased with our purchase. The fan was easy to install and It looks great over our table. Seeded hurricane glass shades are suspended by the rustic leather strapping of this bronzed 8-light chandelier.